Finding a trustworthy pet sitter can sometimes be a challenge when you have to go out of town. That is why our new pet hotel, Lake Hamilton Paw Spa and Retreat, is the best choice when you need to kennel your furbaby. Our luxury pet hotel features raised bedding, cage-free rooms, and live cameras so you can view your pet while you are away. Do not stress over who is going to spoil Fluffy while you are gone, as our trained veterinary staff will provide excellent care. Virtual tours of our boarding facilities are available on our website, but we welcome you to tour each of our kennels anytime! No matter how long you need pet boarding, your pet will be treated with loving care while boarded at Lake Hamilton Animal Hospital. 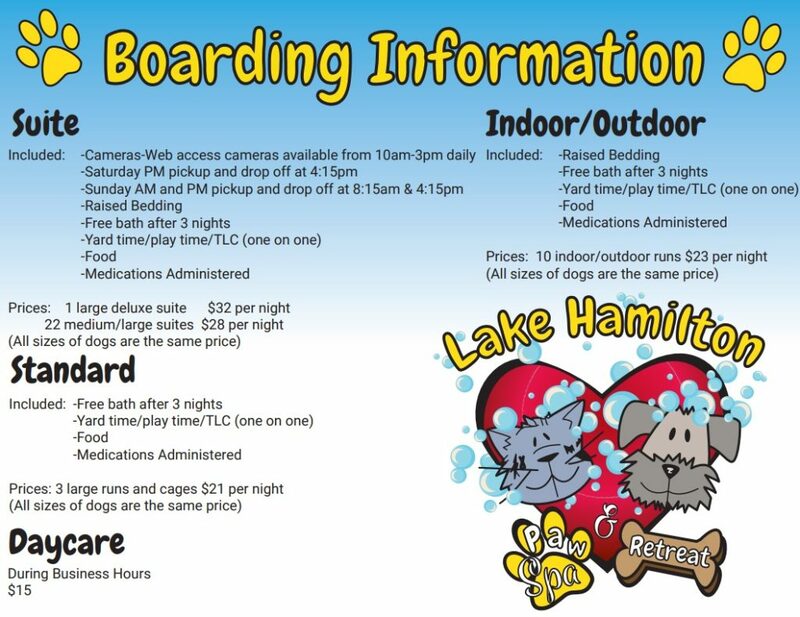 Lake Hamilton Pet Boarding visitors enjoy much affection and personal attention from our trained, professional attendants. We also have individual care where dogs are walked individually two to three times a day for fresh air and to “do their business.” Exceptions are made for those pets deemed an escape risk or dogs that are too aggressive to be handled safely while outdoors. We pride ourselves in providing the highest quality services. Each pet gets a private run or cage for sleeping and eating, and all cats receive litter pans. All quarters are cleaned and sanitized at least twice a day. A pet’s bed or blanket may be brought from home as long as it is easy to launder, and is clearly marked with your name and your pet’s name. As an extremely high quality facility, we offer a variety of highly nutritious options from Purina or Science Diet. If you prefer, you may provide your own food in a container clearly marked with your name, your pet’s name, and any needed instructions. As an extremely high quality facility, we offer a variety of highly nutritious options from Purina to Science Diet. Boarding is very popular at both of our hospitals. Since each visitor is unique, we ask that at check-in, you make us aware of any special needs, exercise requirements, etc. We will gladly administer prescription diets, medications and do whatever is necessary to make your pet feel most comfortable during his/her stay. At Lake Hamilton Animal Hospital, you can even book your feline for our exclusive “Kitty Palace,” where your pet will lounge in her own cat condo! Reservations for boarding are required, but we can often accommodate last minute boarders. Pets may arrive and be picked up during regular business hours. After-hours pickup is also available for pickup at a nominal fee. Additionally, to ensure a safe, disease-free environment for all our visitors, Lake Hamilton Animal Hospital require that all boarding pets be up-to-date on intestinal parasite and heartworm tests as well as all vaccinations. For dogs, the required vaccinations are: Distemper, Parvovirus, Coronavirus, Lepto, Bordetella, Influenza, and Rabies (3-year vaccinations now available). For cat clients, the required vaccinations are: Distemper, Leukemia, Rabies, Bordetella, and FIP.